Inventor Nikola Tesla imagined the technology to transmit energy through thin air almost a century ago, but experimental attempts at the feat have so far resulted in cumbersome devices that only work over very small distances. But now, Duke University researchers have demonstrated the feasibility of wireless power transfer using low-frequency magnetic fields over distances much larger than the size of the transmitter and receiver. 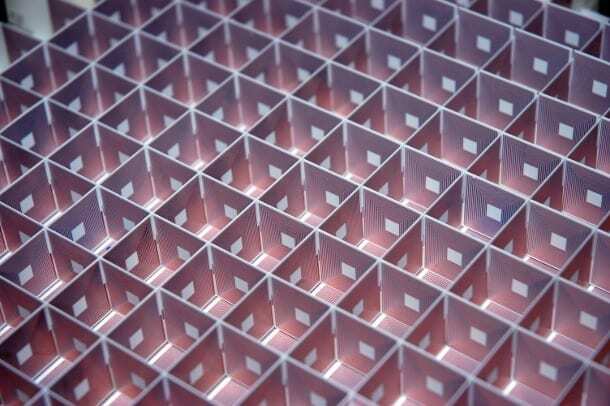 The advance comes from a team of researchers in Duke’s Pratt School of Engineering, who used metamaterials to create a “superlens” that focuses magnetic fields. The superlens translates the magnetic field emanating from one power coil onto its twin nearly a foot away, inducing an electric current in the receiving coil. The results, an outcome of a partnership with the Toyota Research Institute of North America, appear online in Nature Scientific Reports on Jan. 10. In the experiment, Yaroslav and the joint Duke-Toyota team created a square superlens, which looks like a few dozen giant Rubik’s cubes stacked together. Both the exterior and interior walls of the hollow blocks are intricately etched with a spiraling copper wire reminiscent of a microchip. The geometry of the coils and their repetitive nature form a metamaterial that interacts with magnetic fields in such a way that the fields are transmitted and confined into a narrow cone in which the power intensity is much higher. “If your electromagnet is one inch in diameter, you get almost no power just three inches away,” said Urzhumov. “You only get about 0.1 percent of what’s inside the coil.” But with the superlens in place, he explained, the magnetic field is focused nearly a foot away with enough strength to induce noticeable electric current in an identically sized receiver coil.